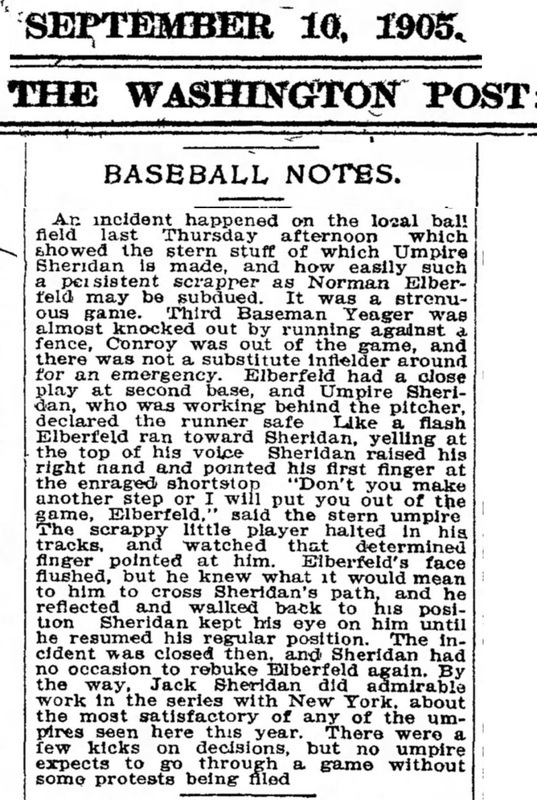 An incident happened on the local ball field	last	Thursday	afternoon	which	showed the stern stuff of which Umpire Sheridan is made, and how easily such a persistent scrapper as Norman Elberfeld may be subdued. It was a strenuous game. Third Baseman Yeager was	almost knocked out by running against a fence, Conroy was out of the game, and there was not a substitute infielder round for an emergency. Elberfeld had a close play at second base, and Umpire Sheridan, who was working behind the pitcher, declared the runner safe. Like a flash Elberfeld ran toward Sheridan, yelling at the top of his voice. Sheridan raised his right hand and pointed his first finger at the enraged shortstop	"Don't you make another step or I will put you out of the game, Elberfeld," said the stern umpire.